The newest contender for the strongest material is found in the sea. Science has discovered recently that teeth belonging to tiny marine creatures called limpets are so incredibly tough they could be used to construct boats. The chompers are 100 times thinner than the diameter of a human hair. Scientists have determined that if we built huge structures from material fashioned from limpet teeth, they would be as strong and unbreakable as the smallest piece of the material – a massive advantage for engineering. 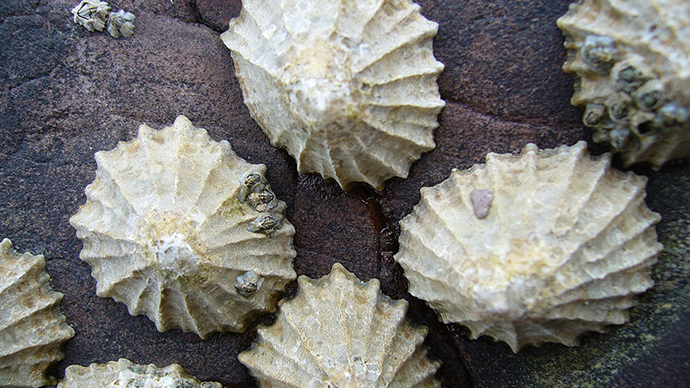 Limpets are snail-type creatures crawling along the sea bed, carrying their portable, cone-shaped homes with them. Scientists decided to use a process known as atomic force microscopy on a set of limpet teeth to test how the material behaves at a microscopic level, and how strongly it bonds together. The University of Portsmouth study came out with surprising results. Professor Asa Barber says: "Until now we thought that spider silk was the strongest biological material because of its super-strength and potential applications in everything from bullet-proof vests to computer electronics, but now we have discovered that limpet teeth exhibit a strength that is potentially higher." And since "engineers are always interested in making these structures stronger to improve their performance or lighter so they use less material," replicating these structures at the atomic level could catapult the science to new highs. Barber listed “F1 cars, hulls of boats and aircraft structures” as just some of the potential production applications. Science couldn’t have done anything with the discovery earlier, because techniques for splitting the ultra-thin mineral have only recently been invented. “We had to cut out a smaller volume of material out of the curved tooth structure,” which is less than 1mm, Barker explains. According to Barker, the challenge with bio-inspired science is finding natural structures that could prove useful and innovative, as there are so many to choose from.